Jakob Wegelius' "The Murderer's Ape" ended up becoming one of our "Book of the Year" winners back in 2017 and as soon as we found out there was going to be a prequel to that utterly brilliant book, we were beside ourselves with excitement. 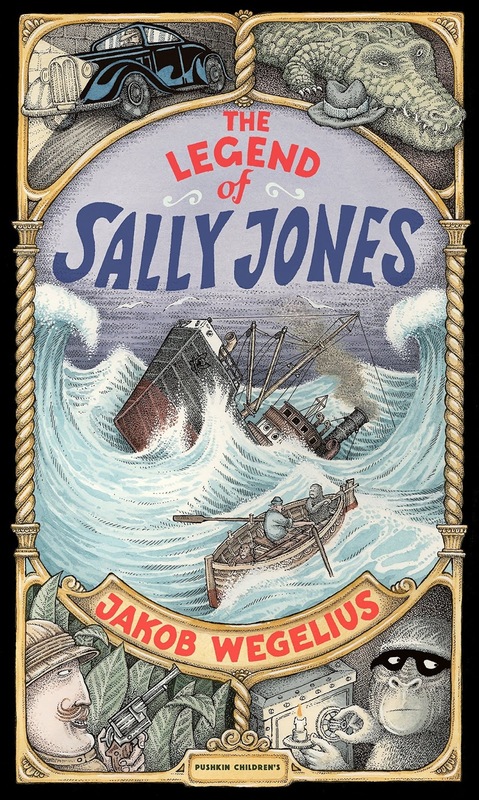 In fact "The Legend of Sally Jones" is more than just a prequel, and chronicles more than just the moment when "The Chief" and Sally Jones herself first meet and become the best of friends, beginning their adventures on the high seas. Just like "The Murderer's Ape", Jakob explores a darkly delicious tale of spine-tingling excitement, terrible misfortune and a search for divine justice as we find out that Sally Jones' early life was anything but charmed. In fact, if we're honest, it was downright tragic! As the story unfolds, you'll feel even more strongly that Sally Jones is symbolic of so many things that empathic folk will instantly identify with, sometimes get angry about, but ultimately see great joy in as Sally's origin story draws to a close that segues neatly into "The Murderer's Ape" (I should point out that you don't need to read them in order - but if you start with this you'll definitely reap the benefit of knowing a lot more about Sally's character and how she came to be such a smart and savvy ship's mechanic). 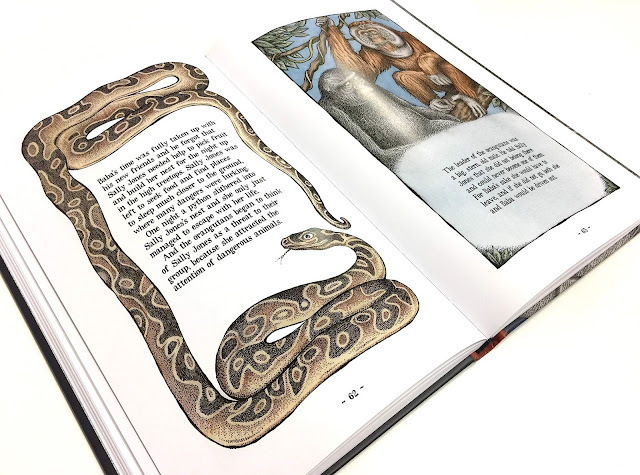 The story opens as a tiny helpless gorilla is born deep in the African rainforest on a moonless and cloudy night - a sure omen of tragedy to come. Though beset by early misfortune at the hands of some truly heartless characters, it soon becomes apparent that this gorilla is far from ordinary - and her destiny will take her on a dizzying globe-trotting journey right across the world and back again. Sally will face cruelty, hardship and meet an amazing array of fascinating and in some cases quite thoroughly rotten characters before she finally meets a humble sailor who, like her, is no stranger to hardship and tragedy himself. The two seem drawn together and their shared destiny will become the stuff of legends. 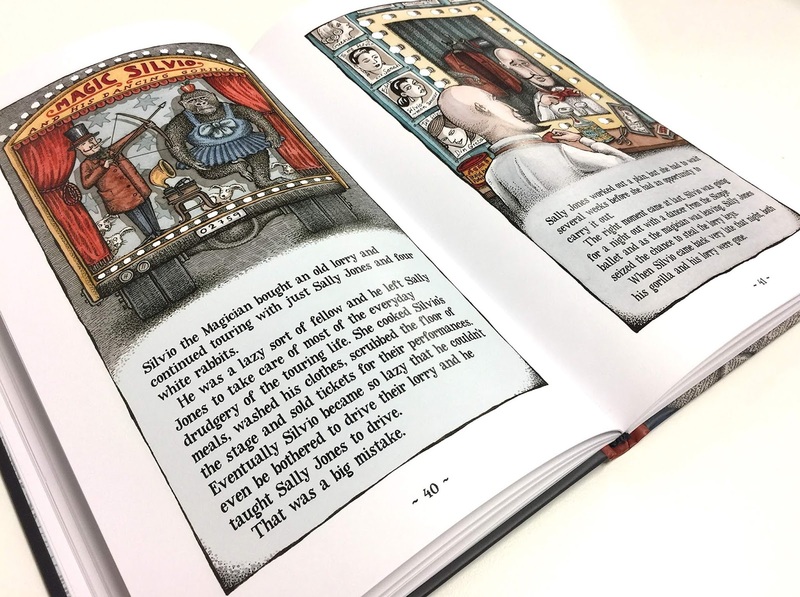 Jakob once again illustrates his own story with a dazzling (and this time beautifully colourful) set of illustrations, which makes this book ideal even for younger kids (and quite a lot of adults - me included) who do love brilliant illustrations underpinning their chapter books. He has such an amazing way of building each scene, populating it with the most fascinating characters, and describing the whole gamut of human (and ape) emotions. But the star, once again, is Sally herself - who despite mistreatment, tragedy and sadness has more than just colossal physical strength and a quick brain. She has a heart as large as the world itself, and the ability to truly conjure more than just sympathy from us, the readers. We deeply care about her, and her eventual fate (and there are so many moments here where you'd almost wish you'd read this story first before "The Murderer's Ape" - though as I said, the order isn't a deal breaker but if you're new to both, you're in for a real treat if you start with this). There may be times where you'll feel this book is a total downer, and sometimes you wonder how Sally has the inner strength to carry on in the face of so many horrible moments and setbacks, but Jakob's genius is in the way he dispenses a good solid dose of karma to the characters who are rotten to Sally throughout. We don't want to spoil things too much but you'll find a lot of joy in those moments for sure. It's utterly, utterly brilliant. Get it, because everyone will be talking about this book. 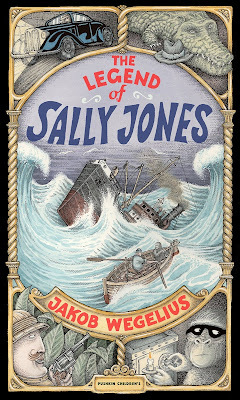 "The Legend of Sally Jones" by Jakob Wegelius is out now, published by Pushkin Press (kindly supplied for review).